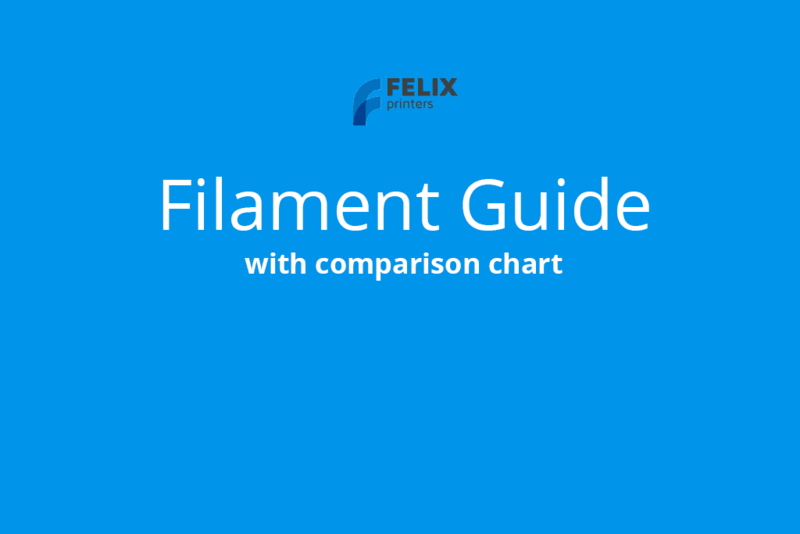 This filament guide will explain different cases about when and how to use filament. The scope of this will be the materials we recommend using and have the highest chance to succeed on our printers. PETG(left) and PLA(right) are easy materials to use for 3D printing. With the 3d printers we offer you can in theory use every material as long as it melts below 275degC and is in wire form with a diameter of 1.75mm (+/- 0.15mm). Diameter accuracy This very important and if not right this could ruin your printjob. Good quality filaments nowadays are specced to be 1.75mm +/- 0.05mm, some suppliers even promise a diameter accuracy of +/- 0.02mm. Next to this it is also important to check the diameter roundness. This is often not specified, but you can check your filament if the roundness is indeed correct. Material consistency This is often overlooked, and mostly only noticed when printing. The diameter of the filament could be good, but if the substance is not consistent, it could be that some parts of the filament, don’t melt, or not fast enough which could cause a clogged hot-end. Shrinkage ratio If this ratio is high, then it could cause problems to print. When you print a part, there is normally a temperature difference between the part you are printing and the newly printed layers. When a material has a high shrinkage ratio, there could come a very big internal stress in the part and it could break. So the lower the shrinkage ratio the easier it is to print. Big parts utilizing the full build volume of the printer are almost impossible to print, when there is a high shrinkage ratio. Adhesion to the build platform The build platform condition is also a very important factor to the equation. The top surface should be compatible with the extruded material. The toplayer of the bed, ensures that the print will stick to the buildplate, but not so much that you cannot remove the printed object after printing. Material rigidity The filament should be rigid to some degree. So the material can be flexible to some degree, which is difficult to specify. The filament is pushed by a motor into the hot-end, if the material is very flexible this could cause issues because the material can buckle and get stuck in unwanted places. Whether your 3d printer is using direct drive or a bowden system as feed mechanism makes a big difference for flexible materials. Safety Some materials can cause fumes when heated which can be toxic. Next to the filament itself we also have to consider the following constraints for dual head 3d printing. A house printed with PLA and PVA to support the roof. The PVA(transparant) can be washed out with water. The two materials should be compatible with each other. Especially if you need them to connect somewhere in the print. For instance when printing a layer with material 1 on top of a layer of material 2. If the layers/materials don’t attach to each other, the print will most likely fail. Each material has it’s benefits and good use, we’ll explain the differences between the filaments in short. 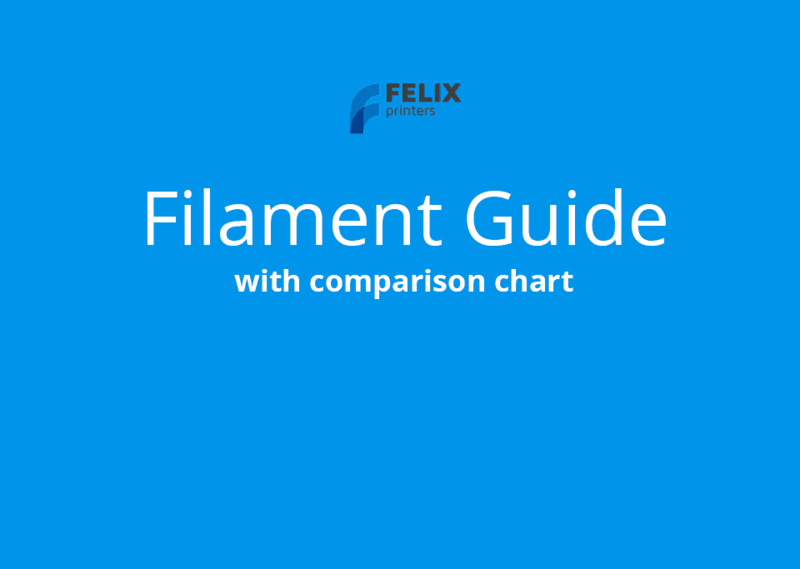 To make it easier to compare the different filaments we also gave them rankings (scale 1…10) on their most important features. This is the best material to start with when you are new to 3d printing. It is made from renewable resources, like corn, sugar cane etc. Even though it is made from corn it is actually a very strong plastic when used below it’s glass temperature of 60 degC. 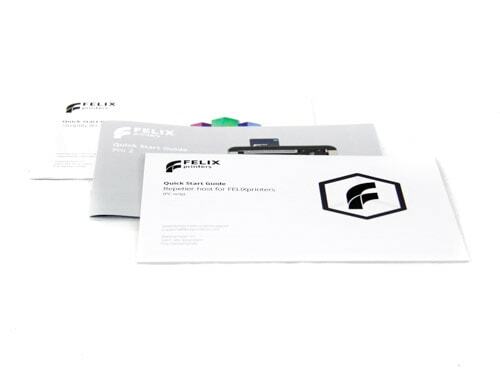 For the printers prior the FELIX 3.0 we used PLA as material to print most printer parts with. In terms of stiffness it is higher than ABS, but it is more brittle and less temperature resistant. Besides the mechanical properties, it is very nice that this material is bio degradable. Under normal environmental conditions PLA hardly degrades, it degrades in high humidity and also at 90 degC. Even then it takes years before fully degraded. So this commenly used filament is also suitable for outdoor applications. This is a very commonly used and often sold plastic apart from 3d printing. It is made from oil and used in many plastic parts in the household and countless applications. Even though it is popular it is not a recommended material to print with for the beginning users. Due to its relatively high shrinkage ratio it is difficult to print. The high shrinkage ratio makes an ABS printed object prone to warping. When 3d printing an object there will be a temperature gradient, the just extruded plastic is hot, but in the middle of the part the temperature is different. When printing material with a high shrinkage ratio it could cause a very high internal stress in the printed part during printing. This could cause the object to warp from the build plate or it could even crack during printing. A beneficial property of ABS is that it can be used at relatively high temperatures (approx. 100 degC) and that it is ductile. It is highly recommended to print ABS in a well ventilated room. The fumes which exhaust from it, can cause dizziness. Also it can be toxic when it melts at too high temperatures. Due to the constraints described above utilizing the full build plate with ABS is virtually impossible. The max recommended footprint is 100x100mm. The only proper way to print ABS is to print in a chamber with controlled temperature. This is how printers from certain manufacturers do it in the € 50K+ segment. This is a very capable material for engineering purposes and more demanding applications. This is the enhanced version of plastic they use in drinking bottles. In terms of thermal properties this is the intermediate between ABS and PLA. The printability is just as good as PLA. It has a low shrinkage ratio, which makes it suitable for large prints. You can utilize the full build plate, without having to worry about warpage. We used this material to test our new extruder design, which was a quite demanding application in terms of temperature and required strength. 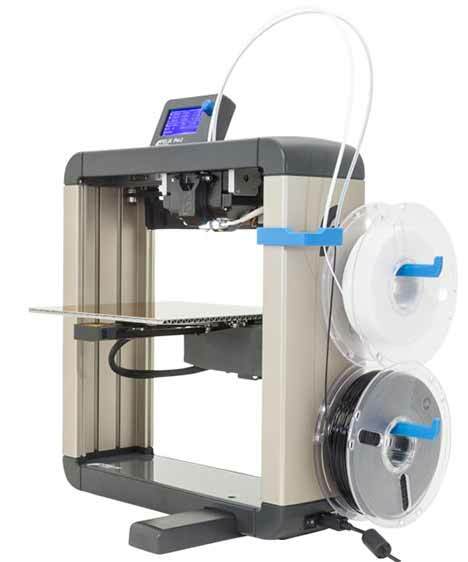 The above 3 filaments are the main plastic materials used with a 3D printer. There are countless different materials which can be used with a 3D printer, below we will describe a few of them we also supply. This filament is based on polyurethane. It is a nice material to use and it is as flexible as flexible silicone. This material is more challenging to print compared to the other materials, due to its flexibility. The print speed should be reduced to approx. 50% compared to PLA otherwise it could buckle inside the hot-end. When you got it printing it prints very reliably and it also is very flexible, but strong enough to not deform while printing. Wood filament is a modified PLA that smells and feels like wood. Due to its PLA base, it is very easy to print. Varying temperatures, while printing, you can create the wood grain appearance. The wood grains make it more brittle than regular PLA, so it should be handled with care. The grains used are small enough to make it still compatible with our 0.35mm nozzles. 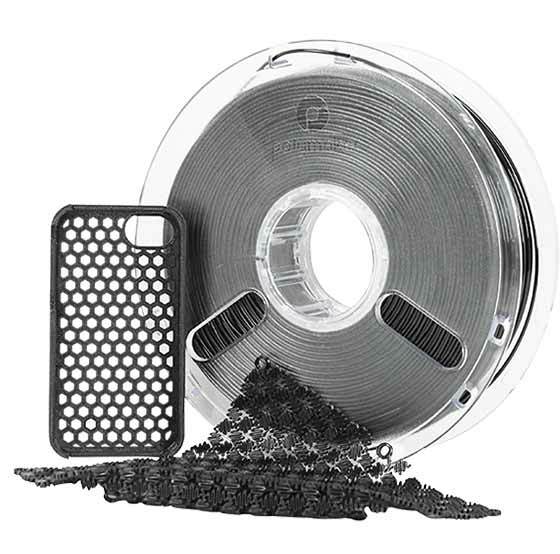 Is a crystal clear, strong, a bit flexible and easy to print filament for 3D printing. These characteristics, together with the high degree of gloss, very low water absorption, almost no warping and flame retardant properties make it a very special filament. The material is FCA (Food Contact Acceptable) approved. In short, a very diverse filament which can be used for many applications. This material is mostly used as dissolvable support material. In combination with PLA this gives the ability to obtain maximum design freedom for FDM printing. Normally you would need to print support material of the same material as the printed object to achieve difficult features. Later on this needs to be broken away with a plier. In some cases you need support material in some places that are unreachable with pliers or cutters. In this case dissolvable support material offers a solution, to still be able to print this geometry. PVA dissolves in water and is environmentally friendly. After 10 minutes it already becomes weak. To fully dissolve it, takes one hour up to a few hours depending on the size. You can speed up the process by removing a large amount by hand and let the remaining to unreachable places dissolve. Also a sonic bath would speed up the process significantly. We have done extensive testing on this material type. It gives a lot of new possibilities, but due to the heavy interaction with H2O molecules, which are present in the air, the following things need to be taken into consideration. Shelf life when opened can be from 1 week to 4 weeks dependent on how moist the environment is. Never let it heated for extensive periods of time. At around 215 deg without feeding material. When the material sits idle in the nozzle at this temperature it starts to crystallize and can damage the tip of your nozzle beyond repair. After printing always remove the PVA filament from the extruder unless you start a new print with PVA right away. There are a lot of PVA filaments available, but only a few work as advertised. If you use a bad quality type, chances of it working are minimal, or maybe for an extremely short time.